My husband loves homemade marshmallows. He has a nut allergy, so he's usually pretty wary of holiday cookies, but our dear friend made marshmallows one year and he loved them so much! I had to try making them too. Marshmallows are not difficult to make, but they require some things you may not normally use in your holiday baking. A candy thermometer is one. A stand mixer also makes things much easier. You'll also need corn syrup and gelatin, which not everyone has on hand. But the ingredients are inexpensive and easy to find. 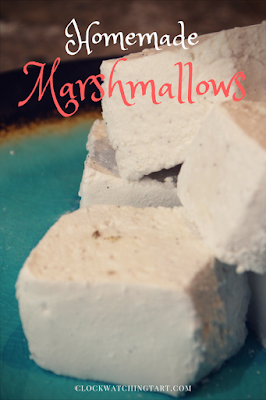 Once you have them you can make marshmallows in any flavour you desire. I made bourbon vanilla marshmallows, but the bourbon flavour doesn't really come through. I would try using more bourbon next time. It is so neat to watch the clear liquid transform into white ribbons as you mix the marshmallows. Marshmallows keep really well at room temperature for up to 6 weeks. They're great in hot chocolate or on a cookie tray (and gluten free too! ), or you can give them as gifts. Split the vanilla beans lengthwise and scrape out the seeds with a sharp knife. Place 1/3 of the vanilla bean seeds in a small bowl with the bourbon. Place the rest of the seeds in a medium bowl with the powdered sugar. Mix well, crushing the vanilla seeds with the back of a spoon to incorporate. Let sit one hour. Brush or spray a 9-inch square baking pan with vegetable oil. Sprinkle with vanilla sugar and tap out the excess that doesn't stick to the sides. Place 1/2 cup water in the bowl of a stand mixer. Add the gelatin and stir to combine. Combine 1/2 cup of water, granulated sugar and corn syrup in a small pot and bring to a boil over medium heat, stirring until sugar dissolves. Add the empty vanilla bean pods to the sugar syrup and place the thermometer in the pot, not touching the bottom. Boil until the syrup reaches 240 degrees F (this took about 7 minutes for me). Remove from heat and use tongs to remove the vanilla beans. Use the mixer's whisk attachment and whisk the gelatin mixture at low speed. Carefully pour the hot sugar syrup down the side of the mixer bowl with the mixer running. Increase the mixer speed to high and whisk for about 5 minutes until the mixture is very thick and looks like ribbons when you raise the whisk attachment. Add the bourbon and vanilla seed mixture and whisk until incorporated. Using a rubber spatula, pour the marshmallow mixture into the prepared pan. Let stand, uncovered, at room temperature, at least 4 hours or overnight, until marshmallow is dry. When you're ready to cut the marshmallows, cover a cutting board with vanilla powdered sugar and invert the pan onto the cutting board. Use a spatula to pull the marshmallow away from the sides if you need to. Dust the top with vanilla powdered sugar. Cut the marshmallows into 36 squares (or 64 smaller squares). Place each individual marshmallow in a bowl of vanilla powdered sugar and shake to cover. Store in a covered container separated by parchment paper.